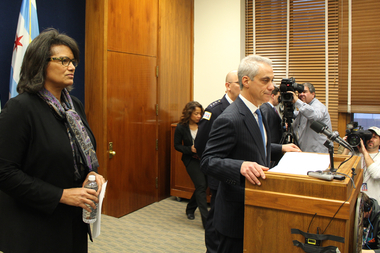 Mayor Rahm Emanuel introduces Sharon Fairley as the new head of the Independent Police Review Authority. CITY HALL — Moving to address concerns over police accountability in the midst of the Laquan McDonald case, Mayor Rahm Emanuel on Monday introduced a new head of the police review board. The Mayor's Press Office announced that Scott Ando had resigned as chief administrator of the Independent Police Review Authority, "effective immediately," to be replaced by Sharon Fairley, a former federal prosecutor and top deputy to Inspector General Joseph Ferguson. Emanuel said Monday he expected her to "reinvigorate an essential oversight body," adding, "At this point, we need new leadership." "The mission of IPRA will remain the same," Fairley said at a City Hall news conference introducing her in her new position. "Thorough, fair and timely investigation of police officers' misconduct." She added, "I bring no agenda other than the pursuit of integrity and transparency in the work that IPRA does." Emanuel granted that, as the review board has disciplined only two officers over approximately 400 complaints since being formed in 2007, "It defies common sense." Citing that the Police Board and the department's own Internal Affairs department have punishment records that are little better, he added, "None of the measures we have taken have ever measured up." Yet he said that, with the help of the Task Force on Police Accountability he appointed last week, he expected all agencies to "build the trust between the Police Department and community relations." Emanuel scheduled a Monday afternoon news conference to introduce Fairley as new head of the authority, and addressed the federal Department of Justice probe into the Police Department announced earlier in the day, saying, "We welcome it, and Chicago as a city will be better for it." He said the increased scrutiny was in the Police Department's interest as well, as it would weed out rogue cops and emphasize the professional work done by most officers. The mayor credited Ando with gains by the review board. "In his four years at IPRA, Scott has taken important steps to move IPRA forward and reduce its backlog of cases," he said in a statement issued Sunday night. "Yet it has become clear that new leadership is required as we rededicate ourselves to dramatically improving our system of police accountability and rebuilding trust in that process." Emanuel said he expected Fairley to bring a renewed focus to the review board. "As an independent arbiter of allegations of police misconduct, excessive force complaints and officer-involved shootings, IPRA is a vitally important part of Chicago’s system of police accountability," he added. "Sharon brings the experience and independence to ensure that when an officer breaks the rules, they will be held accountable." Fairley joined the city earlier this year after eight years as an assistant U.S. attorney. Yet Ald. Anthony Beale (9th) called the move "damage control" on the part of the Emanuel administration, and Ald. Carrie Austin (34th) likewise took issue with Ando's firing. "I thought he was doing a good job," Austin said. The Independent Police Review Authority has been under harsh criticism for not disciplining officer Jason Van Dyke better, after he weathered more than a dozen complaints in his career before shooting McDonald 16 times in October 2014, in an incident that led to murder charges against him amid the release of a dashcam video of the killing. Emanuel lauded Ando's work in reducing a backlog of cases from three years and 325 cases in 2010 to just 26 now, with 73 percent of all complaints made last year completed and closed within six months. Yet the criticism of police accountability led the mayor to make what he considered necessary changes.